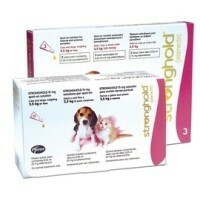 Stronghold for Puppies and Kittens 15mg is for the treatment and prevention of flea infestations for one month following a single administration. Stronghold is ovicidal for up to 3 weeks after administration. Also for the treatment of ear mites and for the prevention of heartworm disease caused by Dirofilaria immitis with monthly administration.